Club Penguin Cheats by Mimo777 Club Penguin Cheats by Mimo777: Club Penguin Igloo Contest Update! Awesome iggies, I tots, Done10 and Pinkboo821! The contest is over now, but don't make any changes to your igloos until October 19th so the judges have time to check it out. 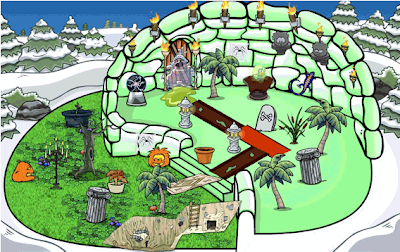 What have you done to make your igloo stand out? Let me know your cool designs! Check out Mimo's Virtual Lounge! Cool igloos! I thought the first one was by far the best! 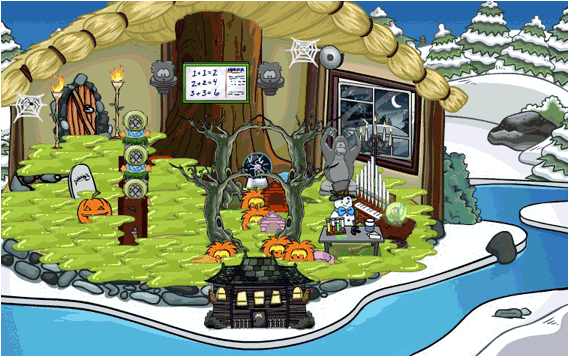 I decorated my igloo for the contest as well! I made my igloo stand out by making a neighborhood! I bought the split level igloo and the bottom part is where the houses, gates, well, garden, and path leading to the community park are. The top level is the park. :) I'm pretty happy with the way I turned out. I don't think anyone else did it this way! I hope I win! But if I don't I'll like seeing what other people do! OMG! CP SAID NOT THE CHANGE IGLOO UNTIL OCTOBER 17! NOT 19! OMG! I CHANGED MY IGLOO AFTER GOLD IGLOO WAS GONE! CP WHYYYYY!!! I didn't really like the second one. Guys you may or may not remember me. If you remember me I would like it. I am now done with CP. It was great while it lasted peeps. May be I will see you again in the future. I'm a new fan. I would like to be a CPG mod like js0404. Can you tell me. NO! I missed the entry dates. I'm going to keep my igloo like this until the next one comes around though. Lol. I have people come to my iggy and they all say that mine is the best they've seen. 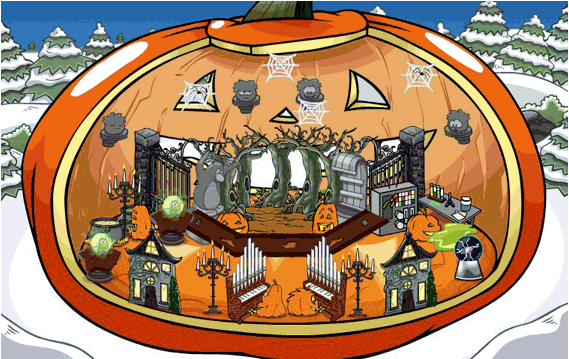 I used the stone deluxe igloo, in stead of the pumpkin, to make it different. Don't worry, there will be runner's-up too! And great job decorating your igloo! Great job! Maybe it took you long to make that thing right? I think that the igloos aren't cool. They are just overcrowded and no themed ('cept for 3rd one). My actually has a theme and deserves to win, along with all the other penguins who never win but should! Your igloo also sounds cool! Everyone has some very creative deisgns! :( I'm sad one more person left CP. Hello, Old Cpg Mod! To become a mod, just answer people's questions! Be nice, polite and tell the truth. Darn! 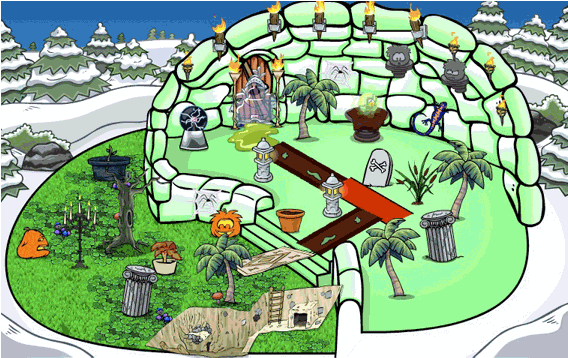 I just changed my igloo since the contest was over. I guess I'm not gonna win. L.O.L. I entered my non-member's igloo. I guess I wanted the judges to see my puffles! I have 8 of them. Well, keep your opinion to yourself. That wouldn't be nice to the person who created it if he/she came to Mimo's site. I'm just saying. I wouldn't say my igloo was so amazing, but I made a haunted house. Outside was a creepy forest, and there was a tent for the fortune. Then there was the gates into the haunted mansion/house. There was a library, eating area, and 2 trapping/experimenting rooms. I also have a little graveyard. I have 99 items, and I want to add more lol! That sounds AMAZING! I wish I thought of that. I did a classic haunted hosue! Results tomorrow and next week!